In the Prologue, you have Eve talking to Naava. Why is the story told in the voices of two other daughters who are not present? Good question. That’s why I added in the clay shards in the Prologue, so that in a certain fashion the clay shards are bringing back the memories of the other sisters–Aya and Dara–who are not present. It was a literary ploy, to be honest. Why are Eve, Aya, and Dara written in first person, but Naava is in third? They were all first person to begin with. Then I needed more elbow room when writing Naava. I needed to put information in her chapters that she couldn’t possibly know. So, I changed her to third person, after being reassured by my agent that other authors had done this with success. I’m thinking of Amanda Eyre Ward’s Sleep Toward Heaven. So, there you have it. Three in first and one in third. How long did it take you to write Eve? I began research in April of 2006. I started the novel in September of the same year. 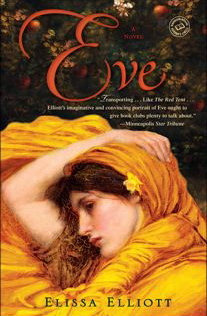 I sold Eve, based on 80 pages around November 1st, and I finished my first draft in February of 2007.